Usage Terms of Concentrated Cleaning Liquid ? If a cartridge has been unused, left empty or stored for a long period of time, the nozzles may become clogged with dried ink residue. Nozzles and printheads are extremely delicate and sensitive and can be damaged easily if any material other than a specifically formulated solvent is used to clean them. Allow print heads to soak in the Cartridge & Printhead Cleaner to refresh the print nozzles and help restore print quality. Inkjet cleaning cartridges have been devised to flush out dirt and blockages from ink nozzles. Using a safe solution of specially formulated solvents and detergents, inkjet cleaning cartridges are able to clean the whole printhead quickly and thoroughly.The regular use of inkjet cleaning cartridges will also prolong the life of your inkjet printer. Usage Terms of Ultrasonic Cleaner ? Ultrasonic cleaning of inkjet printer parts has become a common pratice. It is now one of the faster and more effective technique to recycle inkjet cartridges. Being more indipendent by solvent choice, ultrasonic cleaning reduce the risk of solvent incompatibilities. Delicate and very small parts in inkjet components (nozzle parts may measure only microns), make ultrasonic cleaning very suited to remove swarf, carbon deposits and toner residue without damage. Usage Terms of Steam Machine ? Very necsessary items for cleaning the Nozzles & sponges before every refilling process. You don't need addition items when cleaning the cartridges. Cleaning with hot steam. Perfect tools for opening the nozzles. The sealing of refilled ink cartridges using blue tape is indispensable in order to avoid ink leakage during cartridge transportation and storage. the only relatively secure method of sealing cartridges without using the protector clip is a careful preparatory nozzle plate cleaning and subsequent drying, followed by automatic application of blue tape using specialized machines.. Perfect sealing tape after each refill process. 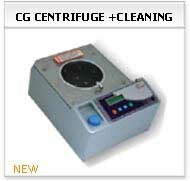 Usage Terms of Centrifuge ? Evacuate every cartridge models with this machine. Before refilling process you must evacuate and this machine can evacuate in 10 seconds.very quickly en effective solutions for the inkjet technology. Especially color cartridges this will be perfect solutions. 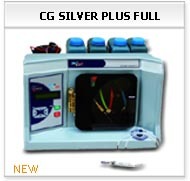 this is universal centrifuge and for the new models every time you won't need additional items. Usage Terms of Vacuum Machines ? Professional Vacuum machine for vacuum inkjet. Many kind of application. 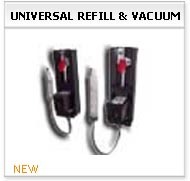 high pressure vacuuming machines can evacuate / empties and vacuum all types before refilling & after refilling process. WHY ALEMINIUM & DERLIN REFILL ADAPTER ? Under high Pressure there is no leaking. 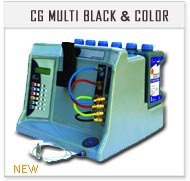 Install – Connect and upgrade your Inkjet Cartridges Refill Machine .